"Jennifer rates high with me based on her professional mannerisms, timeliness, work ethic and for the fine work that she delivered. The site she created for my company shows the pride and detail that Jennifer has in her work. She is timely with updates and in servicing our needs and is very fair when it comes to the price of her services. I would have to say that you get much more than you pay for." "I am the owner of an educational consulting company, Growing Minds Autism Programs. We have been clients of Big Blue since 1998. Jennifer has designed, created and hosted our websites, as well as providing graphic design services for various brochures and printed materials." "She consistently delivers high quality results. Her work is, without exception, creative, attractive and professional. She consistently meets deadlines and is resourceful in recommending effective, appealing solutions to fit within our budget." "These qualities alone would be more than sufficient to warrant a recommendation. However, Jennifer also brings outstanding people skills to the table. In short, she is an absolute pleasure to work with. She is an excellent listener who brings genuine enthusiasm to each project." "Jennifer quickly adopted a proprietary interest in helping our business to thrive and in understanding our perspectives. As a result, she was able to grasp our needs and goals and to translate them into design results that present our company accurately and effectively. She easily accommodates special requests and changes and works smoothly with our other vendors. These qualities make the projects she handles both satisfying and hassle-free." "I have had the pleasure of working with Jennifer who has designed and maintained two websites for me. One dealt with my medical office and the other with the ancillary business. I first decided to use her services when I discovered on the internet another website that she had designed. I was so impressed with it that I contacted her and asked that she do the work I needed." "I think the websites are excellently done. She met with me on multiple occasions and we also worked by phone and email correspondence. The websites are fully complete involving links to other resources. They have excellent graphic design and are user-friendly. Interestingly, Jennifer did such a good job on the graphic design of my website that the graphic she designed was used on the cover of a book. She has been prompt in responding to my questions and has done an excellent job of continuing to be available even after the website was up and running." "I have no doubt that you will be highly pleased with Jennifer's services." "The decision to chose Big Blue was made for me when I entered her website and saw how creative and individualized the different sites were that Jennifer had already designed, including her own. Her work speaks for her. Her websites are attention-getting, attractive, professional and easy to understand and get around in." "Since I had never ventured into this realm before I particularly appreciated Jennifer's ability and willingness to "hold the project together" for me, by serving as my teacher and liaison between all the different parties involved in launching a complex educational e-commerce site. She manifested all that I wanted to see happen, from registering a domain name right through to the promotion of the site on search engines and the creation of print space ads to announce the site." "Jennifer's calm and organized way, her sense of humor, as well as her many years of advertising and promotion experience made this venture a complete delight for me. 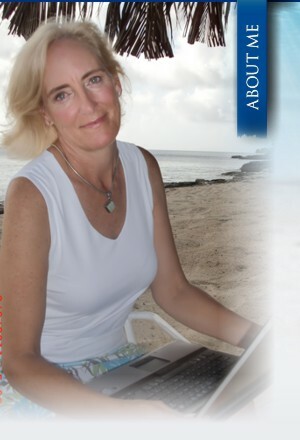 I am pleased and proud of the site she designed for me, and about which I receive rave reviews. I highly recommend Big Blue Design to anyone wanting a strong presence on the world wide web." "Jennifer is a pure delight to work with. I relied totally on her for her sense of design. How she seemed to know just what I'd need, and what would work, is beyond me!" "Besides that, she's thorough, she's reliable, and conversations with her always went smoothly, almost effortlessly. She's an alchemist -- who knows how she does it but she does. Enjoy working with her!" After all that, how could you NOT request a quote?